If there's one thing you can guarantee on an English holiday it's that it will eventually rain. Russell I am so envious of the way you are able to take this inevitability in your stride. Accepting the inevitable is such a simple thing to do, yet something that is almost impossible to do. It's a summer holiday, so you expect the sun to shine. Having said that, we spent a couple of weeks in Vietnam recently where the sun shone every day. Problem was, it so so bloody hot we couldn't be bothered to do anything. 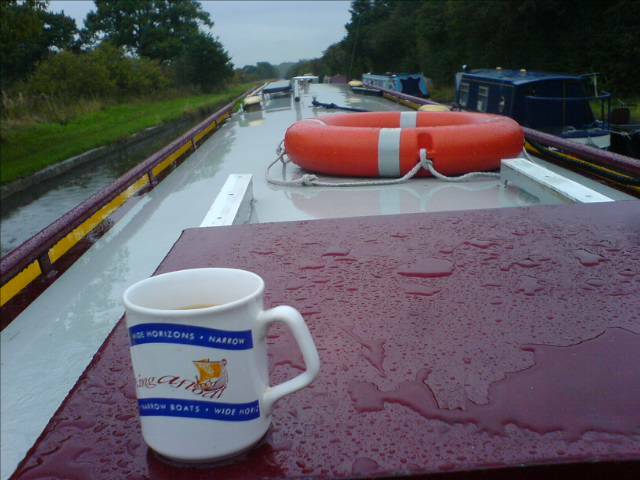 I yearn to get back onto a narrow boat - taking a few years off until the boys can fit into lifejackets. I love the pace, the fact you travel through the countryside and not just between it and the industrial heritage. And very un-media as holidays go. Reading this and thinking of holidays that are 'slow' - which are usually the really good ones - makes me think that perhaps 'Slow' is actually very cool (and yes I am aware of Carl Honore and the Slow Movement etc etc but let's face it - it is still a minority sport). Perhaps in future 'slow' will be SO cool that Honda (well why not - just to be topical fellow bloggers ;-) will make really fabulous looking cars that are deliberately quite slow but are sought after by everyone - including really wealthy people for their 'cool because they are slow and beautiful' factor. I am imagining limited editions designed by other highly creative people (e.g. open source car design done by Gerry Anderson or Terry Gilliam or Miyake or Lacroix?) but are actually extremely cheap as opposed to really expensive (does this break all the rules of Alfred Marshall's supply and demand? John Grant will know of course). In fact when did any car maufacturer recently make an outstanding visual statement with a car body design like the American cars of old? Crikey - sorry about the diversion - anyway Russell - looking forward to hearing your views on the juxtaposition between the 'slow' of the canal part of the holiday and the '_____' (insert here) of the Blackpool illuminations section when you get there.